Our friends here were quite alarmed when they heard that our recent travels to India would involve two nearly 10-hour flights each way. How would a toddler handle it, they wondered? We wondered too, with not a little apprehension. It is not a simple trip. Before we left, we had to get Lila a typhoid vaccine and bitter anti-malaria tablets to take every day as a precaution. The air travel is just the first of many parental concerns. But flying does not seem to bother our girl. During the long haul flights, she was allowed more or less unlimited access to juice and in-flight videos. As a result, she thinks air travel is the greatest thing ever. And bitty thing that she is, she could curl up in her seat and took long naps on the airplane as well. As with many things related to kids, you get what you get. We got a kid who enjoys flights. But who has slept through the night only like 8 times in 3 years. Others may have a child who screams for 8 hours of the 9.5 hour flight but who sleeps 12 hours at a stretch at home. Like I said, you get what you get. While we were in India, Lila ate whatever we ate. The only food we packed for the trip for her was a container of oat mix for her favorite breakfast of warm oatmeal with apricots and raisins. From the time she could barely walk, she learnt to carry the boxes of oats and dried fruit out of the pantry, pry them open and fling handfuls into a bowl. This will go down in her personal history as the very first food she learned to "cook". This oat mix has the same just-add-hot-water convenience of that instant oatmeal that you buy in sachets but you get to decide what goes in and what stays out. Oh, and it takes 30 seconds to put together. This is our basic raisin oatmeal recipe, but you can make all different flavors by just changing up dried fruits and nuts and adding spices or flavorings. To make instant oatmeal, I simply stir together the following ingredients in a bowl. 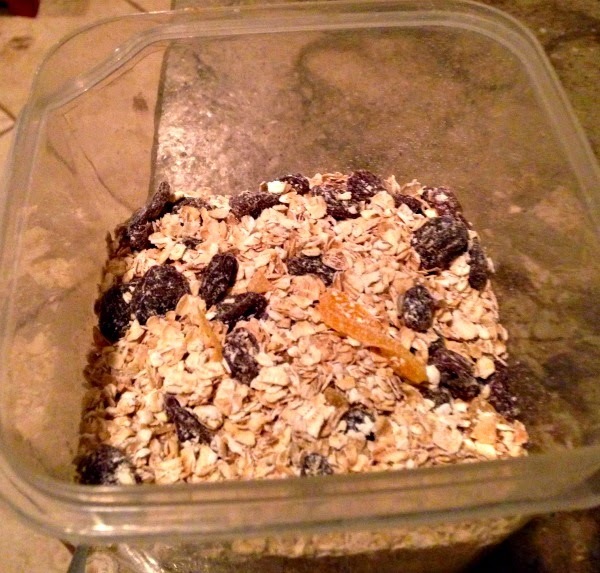 Store the instant oatmeal in an air-tight container at room temperature. How you cook it depends on whether you have access to a microwave oven or a kettle. Measure some oatmeal mix in a bowl, add equal parts water and cook in microwave oven for 30-60 seconds. Alternatively, add boiling hot water to the oat mix, cover it and let it sit for 3-5 minutes. Either way, you have mushy, comforting oatmeal pretty much instantly. Speaking of water, several friends told me that they only drink bottled water when they visit India. I did buy a case of bottled water when we first got there, to get through the first few days. My heart sank as we collected a pile of empty water bottles, destined to sit in a landfill for most of eternity. I just couldn't deal with it. For the rest of the trip, all three of us drank home-filtered water. Most of our relatives seem to have some UV filter like Aquaguard installed in their kitchens. And it was just fine. None of us had any tummy troubles. Not even the one who (I won't name names) tends to drop food and then nonchalantly eat it off the floor. Bottled water or no bottled water, any travel anywhere can be ruined by infections and illness and I'm so grateful that we got lucky this time. Lila has turned three and she entertains and exasperates me in roughly equal measures with her toddler antics. This morning, I made her cocoa in a ceramic mug and she wanted me to pour it into a steel tumbler. What's wrong with the mug, I asked. "It's too glassy, mama", she explained. I am planning an India trip with my baby too. Lets see how it goes. My baby loves oatmeal too. Adding jaggery is a nice idea. I hope you and baby enjoy the trip! I know- toddlers crack you up on a daily basis. Why would you give a child sweet oatmeal (regardless of how it is sweetened)? From there it is a progression to sweet cereals. Oatmeal is equally tasty when made with half milk/half water (or all milk for more of a dairy hit) and a pinch of salt. None of my business, I know, but I have to tell you that jaggery is incredibly healthy. It's full of iron and minerals and is a great source of energy for growing children. 2 tbsp jaggery for 3 cups of oatmeal (which is like 12 servings) does not amount to overly sweet oatmeal. In any case, the whole point of making it at home is that you can add sweeteners or not- your choice. There's no inevitable progression to sweet cereals unless a parent goes out and buys sweet cereals. The DIY oatmeal sounds terrific. A relative bought me a packet of dried cranberries from the US. I honestly don't care for them at all. Do you think they could be put to use in this oatmeal? Do you (or anyone else) have any other ideas how I could use them up? She brought them very lovingly so I would really hate to toss them out. Would appreciate any inputs. I keep telling people who visit India that it is totally safe to drink UV or RO filtered water and it's probably cleaner than bottled water. Not to mention the environmental impact of all those bottles, as you mentioned. It's sad that most people don't seem to agree or care. I applaud you on your bit of effort to reduce landfills. We add the dried cranberries to pulao and biryani since we like its taste better in savory dishes than sweet. You can also soak them and make a chutney out of them. You can also ask the relative on ways she likes to use them, she may have some good suggestions too. Adding them to pulao is such a brilliant idea. I think I too will like them better in savoury dishes. Thanks both of you. Glad to hear Lila traveled well - makes for a much better trip for you as well as for her - and I love your instant oatmeal - as while back E took to the sachets of instant oatmeal which just seemed crazy when it is easy to make your own - he now makes his from scratch every day and sylvia and I often have some - and she will often just eat a handful of oats raw if she can get away with it. In fact she loves to make uncooked porridge with oats and milk and whatever else is about. We love baking oats to make granola- that's very popular with my husband, especially if I go extra heavy on the nuts! LOL ah the glorious street food! We definitely hit all our favorite foodie spots as well. And funny enough, most of our chaat and frankie eating was in mall food courts. It was fun reading about Lila's first trip to India, so glad it went smoothly. Belated Happy Birthday to Lila, May this year be full of long sweet dreams all night long for her and you too. I can't get over the '8 times in 3 years' of full night sleep, how do you function? I mean really? I become a very different person (not at all pleasant) if I don't get a good night's sleep so I am in complete awe. Its great that Lila loves oatmeal for her breakfast than any packaged sweetened cereals. I used to make my own oatmeal too, I love customizing the flavors as per my mood. I use to sweeten it with chopped dates and figs. My current favorite quick breakfast is a mildly sweet 'thalipith' made with over ripe banana or plantain. I mix very fine semolina, pinch of salt and some cardamom or nutmeg powder to a mashed over ripe banana or plantain and make a flatbread of sorts flattening the moist dough with my fingers on a tava greased with some ghee. It tastes sweeter as it cools down and I love it on its own or with a drizzle of honey. I am chronically sleep deprived, no question about it. Like last night, Miss Lil called for me at 1:30 PM and then every 30 minutes after. Just to get tucked back in. But I couldn't get any sleep basically. No doubt I am crabbier than I would be with some decent sleep! But I suppose the body adapts. She was actually sleeping pretty well this Spring and I thought we turned a corner, but then the India trip has set us back many months with the sleep routine. Your thalipeeth sounds very decadent and wonderful! Nice post! You got lucky with no illnesses. You never know what bugs you might get, even with home filtered water. We used to buy big jugs of bottled water on india trips and boiled that water for drinking. For washing baby's face, we used bottled water too since babies tend to swallow bath water. Even then both babies got bad upset stomachs etc. because of eating stuff off the floor and also drinking water offered by people from pooja prasad! Even though we visited India once a year with them, I would always eagerly wait to come back to the safety and freedom here (eat wherever you want and drink water from any tap). Well, there is actually a good body of research that suggests that there is such a thing as "too clean". Kids who are not exposed to a reasonable spectrum of pathogens are actually worse off because their immune systems are not prepared to deal with diverse microbes that one encounters. Essentially, what I'm saying is that my loosey-goosey parenting style may have paid off. I'm not fastidious about what my kid eats or drinks or where she plays (whether in the US or India). In India, we happily ate in food courts and ordinary restaurants. She used tap water for washing and brushing. It is impossible to say whether our staying healthy was sheer dumb luck or a robust immune system or a combination of the two. But I am saying that it is not a bad idea to let kids encounter the bugs that are out there. I agree Nupur, I feel like because my kids have gone to daycare (aka germ central) since they were very young here, they have a stronger immune system. Funny thing though is that, when we went to India last winter, they were perfectly fine for 4 weeks but fell sick when they went back to daycare after we came back. We too use tap water for bathing, brushing in India and my 4 year old went everywhere with us and ate what we ate. It's good to see your posts again. Both my kids have never liked oatmeal but love granola so, that's what I make/buy. This is a great idea though, I love anything that speeds up morning routines. The DIY oatmeal is nice..I make that for myself for quick weekday breakfasts...I have a tub of such mix at work, and I just mix hot water and let it sit for sometime. So easy and healthy! We eat oatmeal everyday too! Have you tried soaking it the night before? I heard that it is more healthier that way as it gets rid of some toxins. Not sure if it is true but atleast in the morning I have to just warm it up and it comes out very creamy. Happy Birthday to Lila! Three is such a fun age. Boy the questions my three year old used to ask! Now at five, it is even more joy to talk to him as his questions are more scientific and relevant! Yes, three is a fun age and I get peppered with lots of questions needing complicated explanations for the simplest thing. Whew. We pronounce Lila with a short i (rhymes with villa). Indians tend to say Leela and Americans tend to say Lyla. Sigh, so much for choosing a simple name :D But we love the name anyway and the pronunciations are not a big deal. Nila is such a lovely name!! Good choice! Lovely post. Lila is growing up beautifully and it is nice to read these stories about her on your blog. My daughter is a big fan of oatmeal as well - I just take the steel cut oatmeal and cut up different fruits every morning into it and give it to her with some milk. She's 5 now and only eats oatmeal or eggs in the morning for breakfast every morning. We've had great flights then not so great visits to India - 3 trips back home with a hospital stay or ER visit every time for the little one stressed us out quite a bit. We've stuck with bottled water (that is reboiled at home for drinking/brushing for her) at all times. She still loves going back to family every time though so no lasting damage to her relationships at lease :). I love eggs for breakfast but Lila's not fond of them at all. Oatmeal or eggs makes for such a filling breakfast. The hospital stays must have been so scary for you! Oatmeal - I once spent 2 weeks in hospital - and was served lumpy oatmeal every morning. I have never learned to like it after that - my nose starts to smell the hospital smell when I see oatmeal. That was 12 years ago but it just doesnt go away! The only time I ate oatmeal was when someone made it as upma - that was yummy. I am with you about not coddling my kids in India - they have gone every summer pretty much for the last 12-15 years and they eat what we eat and drink what we drink. Their grandmother keeps them out of really dirty food but I suspect that would have happened even if they lived there. They have a gala time and we don't spend our holiday worrying. Food associations are so powerful, aren't they? Sorry that oatmeal is ruined for you. Why is hospital food so awful? I agree about the food in India- we never did eat actual street food even when I was growing up. Everything else is fair game. So much fun reading this Nupur! We're headed to India with Nikhil around his six month birthday. While we, the adults, have never really done the bottled water thing, Even with the baby, it will likely be a boiled water deal, no bottles. I'd love to not bother, but I'd rather not take the chance with such a small baby. Boiled water makes perfect sense for an infant, Sharmila. Good luck with the trip and hope all three of you have a wonderful time! Nupur! I am glad you stayed healthy thru your trip and and after reaching home. I would not have been able to forgive myself if anything had happened to you after eating at my place. About dropping food on the floor, I know many people worry but I think no child grows up without doing it. But since I don't have kids I think of it differently. I as an adult am guilty of dropping food too but if it is uncooked I wash and put it for cooking. Knowing that cooking will kill any germs. But if it is a fruit or veggies to be eaten raw then it is discarded. Belated birthday wishes to dear Lila! We visited India a couple of weeks before my do turned 2. For the first 4-5 days we gave him bottled water, once he adjusted to everything, we switched to Aquaguard.